How should Hey Sugar Cupcakes be stored? Can I order a variety pack? How does the jumbo compare to the standard in size? Can you create custom orders? Do you supply Display Stands? YES! We can ship worldwide. Our cupcakes are flash frozen before shipping and sent using special cooler boxes and dry ice. They arrive looking and tasting the same as locally. Shipping rates are subject to change. Here are some actual rates that customers have paid to ship cupcakes: Florida 6 to 18 standard cupcakes $30. Pennsylvania 36 standard cupcakes $70. New York 36 standard cupcakes $105. Since we are located in South Florida, shipments within the Southeast USA will be far less expensive than other regions. YES! We deliver to most of the tri county area. That's Broward, Dade and Palm Beach County. Delivery within Weston is $5 to $7. Cities bordering Weston are usually $10 to $12. And the farther away the more the delivery will cost. Our cupcakes are best eaten fresh. Key Lime requires refrigeration but all others should be left at room temperature. If you not plan on enjoying our cupcakes within a few days you can refrigerate or freeze them. We formulate the majority of our recipes to remain shelf stable for up to a week without refrigeration. Our jumbo cupcake is what you will find for sale at The Cheese Course and other places where we sell cupcakes. 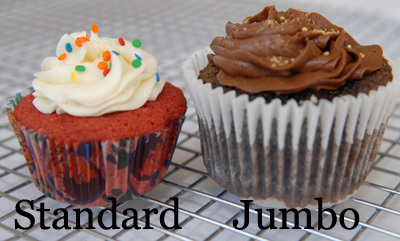 Jumbo is approximately an 8 bite cupcake while the standard is a 4 bite cupcake. Jumbo cupcakes are best ordered 1/guest while standard are best ordered 1.5/guest because they are small enough to enjoy more than one. We are working on mini cupcakes but have a minimum of 50 per flavor. We are also having trouble with the liners peeling away from the mini cupcakes and are generally not offering them until the problem is resolved. Cupcake stands can be rented for $5 to $10 each. We have a variety of stands to choose from and are happy to discuss your options when placing your order.